This is one of the more ridiculous bans in my opinion - my husband almost missed a flight over it. 2 years ago we went to San Diego after the holidays and my birthday is just after Christmas. We were staying at the Hotel del Coronado and the girls went to the gift shop and bought me a snow globe of the hotel for my birthday. I didn't think anything of it and packed it in my carry-on. At security it showed up when my bag went through xray and they told me that I either had to throw it out or go back and check it. Emma started to cry b/c she thought they were going to throw out my birthday present so my husband had to go back and check in his carry-on with the snow globe. I went ahead to the gate with the girls and he made it back just before they closed boarding for the plane. There's simply no room for common sense at all. I always thought this rule was a little extreme. They are now allowing those small snowglobes as long as they fit into your plastic 3-1-1 bag. Yay for those who buy the small ones. Ummm ... what? That's up there with one of the more insane restrictions I've seen. I can't say that I've ever looked at a snow globe and thought "wow this would make a great concealed weapon on a plane"
I once saw a great new story about the Austin, Texas TSA warehouse of confiscated security checkpoint goods. At some point, they open the doors and sell it all off (except the guns/knives). 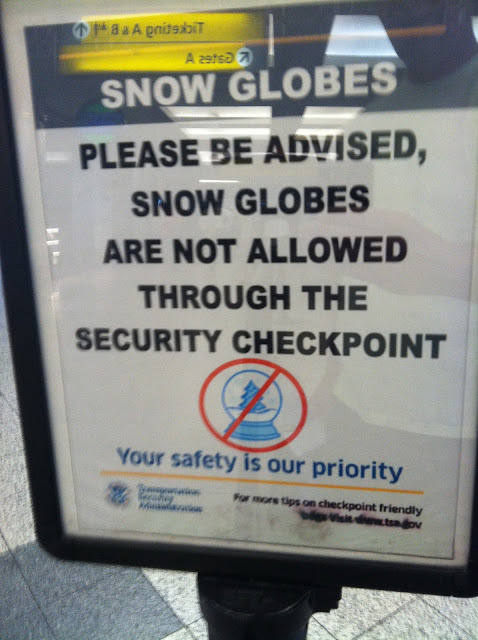 You should have seen the snow globe collection the TSA had! I bought a snow globe somewhere a couple of years ago (I can't recall where) and t there was a sign there warning us about that. Thank goodness because if they would have tried to take away my daughter's snow globe, there would have definitely been an international incident.